I am a sucker for key limes. If key lime pie is on the dessert menu, chances are good that I'm going to order it, even if I wasn't planning to have dessert. Forget the chocolate, forget the ice cream. The only thing that will trump it is butterscotch anything, but you don't see that on the menu too often around these parts. Other than pie, I don't see too many recipes that use key limes. I have had so much success with the recipes in Tish Boyle's The Good Cookie that I didn't hesitate on this one. It is with only the least hint of irony that I confess that the recipe says you can substitute regular limes for key limes, which I did. The key limes at my grocery store always look sad and neglected, and I'm not a fan of bottled lime or lemon juices. I did already have a couple of limes in the refrigerator, though, so I decided to just use those. I don't know how much different that made. I found these cookies to be . . . odd. Not bad, just odd. The dough itself was tasty - more crisp than tender, and not too sweet. But I didn't taste the lime until the very end, just before swallowing. Usually that's a good thing, that extra rush of something new that brings everything together, but in this case it didn't really bring things together for me so much as jumped up and took over. Limes have that sourness to them that makes a unique contrast to the sweetness of the cookie dough. There was cookie and then lime, not cookie with lime slowly adding to the overall flavor. They were different, and that is always good in a cookie given how many similar kinds are out there. I would definitely try them again using key limes to see what kind of difference that made. And I would make them again with regular limes because they were so unusual and a refreshing break from the flavors with which I am most familiar. 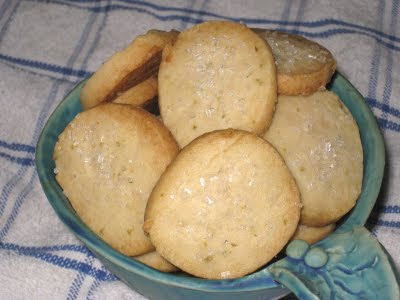 But I will especially make them again so I can give some to Bob, who said they were the best cookies I've made so far. In the bowl of a food processor, combine the flour, confectioners' sugar, baking powder, salt, lme zest, and ginger and pulse a few times until combined. Scatter the butter pieces over the flour mixture and process for 25 to 30 seconds, until the butter is in small pieces. In a small cup, combine the lime juice and vanilla extract. With the machine running, add the lime juice mixture through the feed tube and process for a few seconds, until the dough starts to come together. Turn the dough out onto a work surface. Knead it a few times, until it comes together. Divide the dough in half and roll each piece into an 8-inch log. Wrap each log in plastic wrap and refrigerate for at least 2 hours, until firm (or up to 3 days). Position a rack in the center of the oven and preheat the oven to 325 deg. F.
Unwrap the dough. Slice each log into rounds about 1/4-inch thick and place the cookies 1 inch apart on ungreased baking sheets. Sprinkle the cookies lightly with coarse sugar. Bake the cookies, one sheet at a time, for 14 to 18 minutes, until very lightly golden around the edges; do not overbake. Transfer the cookies to wire racks and cool completely.